The rooms have a sweet sight on the great valley and on the ski slopes. 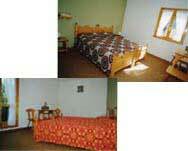 The rooms are more simple, roomy and well-lighted room. All with privated bath and shower. The service is particularly taken care of the owners., for tender the best to all the guests.